With volatile energy costs, a good return on investment may be obtained by adding insulation to homes, offices, farm shops and other heated buildings such as greenhouse headhouses or boiler rooms. Insulation can provide benefits in winter by keeping expensive heat in and in summer by keeping unwanted heat out. Although all building materials have some insulation value, the term “insulation” usually refers to materials with a relatively high resistance to heat flow that are designed specifically for that purpose. R-value is a term that describes the ability of a material to resist heat flow. The higher the R-value, the better the insulation. Insulation works basically by trapping air and air is a good insulating material. Air entrapped in the small bubbles of foam or the small spaces in fiberglass retards heat flow. The thin film of air surrounding these spaces also retards the heat flow. Together a thermal resistance (R-value) is established. Technically R-value is measured in ºF – square foot – hour/Btu. 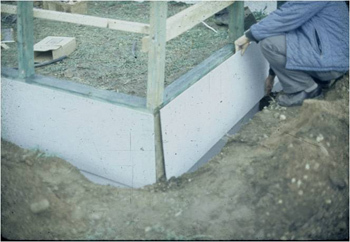 Insulating a greenhouse foundation with styrofoam board. The climate where the structure is located. For example, a headhouse in St Paul, MN, will lose nearly twice as much heat as one in Cincinnati, OH, or Albuquerque, NM. The design temperature used. A headhouse (structure attached to greenhouse for potting, storage, etc.) that is heated to 70ºF will require 40% more heat than if it is heated to only 50ºF. The amount of ventilation needed for moisture removal. This make-up outside air has to be heated during the winter. The heat from equipment and employees in the building can be conserved and used for heating the ventilation air if more insulation is installed. The cost of fuel to heat the building or the cost of electricity to run fans or air conditioning. With increasing fuel costs, this is the major reason to install more insulation. The local building code. The R-value for floors, walls and ceilings in some buildings is specified in the code to meet local or national energy conservation goals. Most insulation materials reduce heat flow caused by conduction or convection. Those that have an aluminum surface may also resist radiant losses if the shiny surface faces inside and has an air space in front of it. Ease of installation. Blanket or batt type insulation is easy to install in walls during new construction but rigid board material placed on the surface or fill-type material blown in through holes may be the only type that can be conveniently installed to insulate an existing wall. Fiberglass or rock wool is commonly blown into attic space as it can be applied at 12” thickness or more. Fire resistance. Materials that create toxic gases or contribute to flame spread should not be used unless covered with a non-flammable material. There have been a number of fires in buildings that had unprotected, sprayed-on urethane foam insulation. Vapor barrier. Moisture is a good conductor of heat. Moisture from inside the building that migrates into the insulation reduces the R-value and can contribute to deterioration of the wall. Either a vapor barrier as part of the insulation or a separate 6-mil polyethylene sheet should be installed on the heated side of the ceiling and walls. Fiberglass, even with a vapor barrier, is not a good choice for a connecting wall between an attached greenhouse and a headhouse as the moisture in the greenhouse is driven into the insulation by the high temperatures developed. Also polystyrene beadboard is permeable to moisture and should not be used where a vapor barrier is needed. Cost. A comparison based on total cost/unit R-value may be the best way to compare materials. Cost includes materials, labor and equipment, if needed. For example, 12” of blown-in insulation with an R26 will have the approximate cost of 29¢ for the material, 23¢ for labor and 17¢ for the equipment to put it in place for a total of 69¢/sq ft. Nine inches of kraft-faced fiberglass batt insulation with an R30 will cost about 55¢ for materials and 13¢ for labor for a total of 68¢/sq ft. Based on R-value the batt material is a better buy costing about 14% less. The cost of insulation is a factor, including installation costs. The marginal value of energy saved (either through less heating or cooling) should exceed the cost of insulation. Windows. Although insulation can reduce heating cost considerably, windows with an R-value of 0.9 for single glazing and 1.4 for double glazing can have a significant impact. Infiltration of cold air around doors, windows and other openings also increases heat loss. Research on one group of homes found that infiltration caused 45% of the total heat loss in the average home. Payback for investment to bring ceiling/wall insulation values up to a minimum of R40/R20 in northern states and R30/R20 in southern states is usually less than 3 years. As fuel prices increase, this payback will be shortened. Insulation Fact Sheet from Oak Ridge National Laboratory and DOE. The BuildingGreen Guide to Insulation Products and Practices from www.buildinggreen.com, includes detail sufficient for design professionals; 2011; purchase price $129. Put a lid on heating costs by installing ATTIC INSULATION – Montana State University Extension Energy / Weatherization.